Our fleet are always ready to perform water bombing operation. 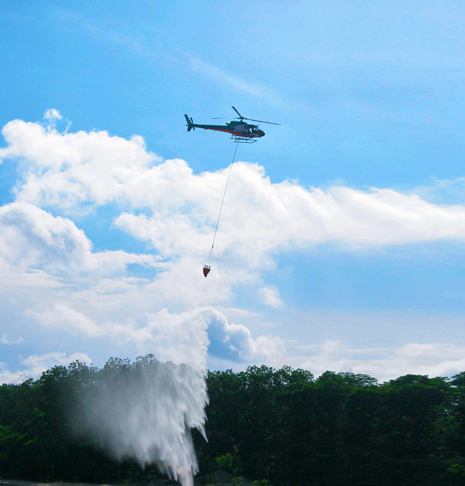 Our fleet are equipped with Bambi Bucket for aerial fire fighting. Our pilots are qualified and experienced for this high risk operation. Our long-standing reputation for providing service excellence makes us an industry leader. We have over 30 years of fire management experience in aerial forest fire fighting and employ more than 50 skilled people. PT. Eastindo Services provides emergency response and fire fighting support with its fleet of two rotary wing aircraft, the Airbus Helicopter AS350B2 and AS350B3e. This fleet delivers powerful and reliable helicopter fire fighting and emergency response capability. Copyright © 2016 Eastindo. All rights reserved.